This year the focus of the International Day for Disaster Reduction (13 October) is on some one billion people around the world who live with some form of disability. Representing one-fifth of the world's population, persons living with disabilities have unique contributions, often overlooked, to help reduce the risk of disasters and build resilient societies and communities. Celebrating IDDR? Share your photos! 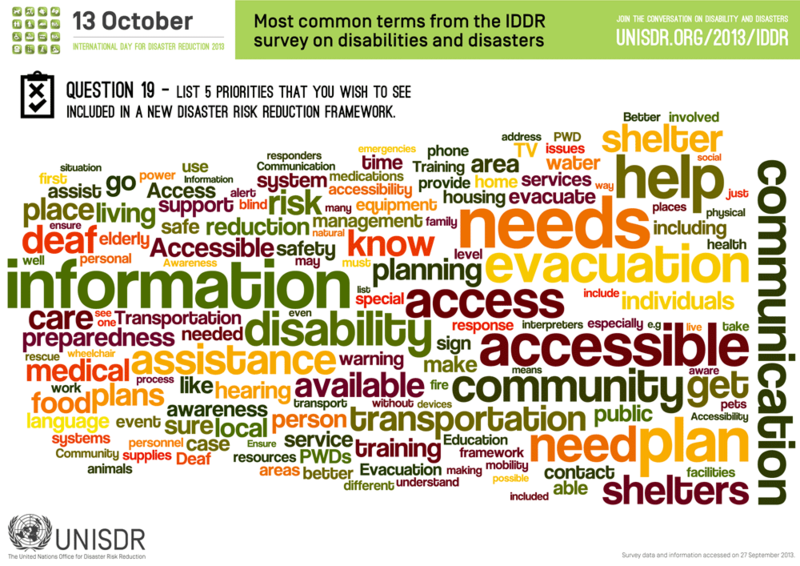 Learn more about the Preliminary findings of the IDDR survey. 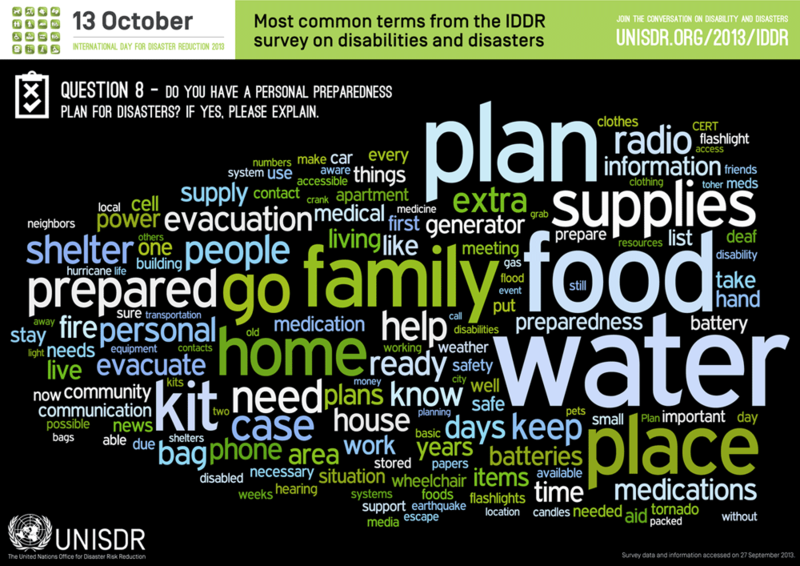 DEADLINE EXTENDED - Given the interest in the survey, UNISDR will extend the survey until the end of 2013. Personal Plan - Do you have a personal preparedness plan for disasters? "In my place of work I have an evacuation plan to escape in case of fire or disaster. I also do not stand with the rest of my colleagues when they have evacuated the building under a test so that it does not have a bigger impact on my health and my disabilities." "In my local country, there is not all preparedness plan for the deaf community. For example, if it is haze from fire in Sumatra, Indonesia, then we are prepared to buy face masks from pharmacy. Another example is the problem we face as we are stuck at subway due to the technical problem, accident or fire, and flooding in partial areas." "Hemos preparado la casa para salida fácil en caso de terremoto, y hay una luz de emergencia en la escalera del segundo piso." National Plan - Are you aware of a national disaster risk reduction plan in your country? "Not necessarily - how do you communicate with someone who's deaf? I'm not aware of national text messaging for example." "No sé si hay un plan, pero cada vez que ocurre algún desastre se cae en el mismo problema, no hay información para las personas Sordas, noticias sin interprete." "It is improving. They're being integrated on paper but hasn't performed well operationally. The understanding & knowhow to appropriately work with people with access & functional needs or AFN resources is still lagging." City Plan - If your municipality, city or local government has emergency, disaster management or risk reduction plans, do they address your access and functional needs? "We still don't have interpreters training program, therefore, most of sign language interpreters are not fluent in Saudi Arabian Sign Language. So even if the interpreters appears on the TV, Deaf persons don't get access to full information. As many information is missed and the interpreters use artificial signs that Deaf people don't understand them, besides, there is no Closed Captioned in Arabic language for the Deaf and hard of hearing people who don't know Saudi Arabian Sign Language. The interpreter' s window on teh TV is small, so the signs are not clear." "No one has ever asked me any questions about my disability except when I am applying for state help." "No existe la infraestructura suficiente para el desplazamiento, ni cultura de apoyo a personas con discapacidad." "Il n'existe pas de réel suivi des mesures édictées. Par exemple lors de l'incendie dans un grand marché de la capitale, les bornes d'incendie n'étaient pas alimentées en eau pour les pompiers, et des camions des pompiers n'avaient pas de carburant pour se rendre à temps sur le marché, à moins de 2km de la caserne des pompiers. Le plan est seulement sur papier, mais sans réelle portée pratique." Participation - Do you wish to participate in community disaster management and risk reduction processes? "I am my Mother's caregiver, filling out this form for her. She has dementia, and cannot care for herself, drive, or in other ways participate in planning for a disaster. I, however would be willing to help in the planning." "I, myself, am deaf. I am survivor of Hurricane Ivan in P'cola, FL. The deaf community depended on each others to keep posted of the foods, assistance, place to stay temporary, places to dump the trees, etc..... Lack of communication access to deaf community by churches, mayor, FEMA, Red Cross & others." "I want to know how wheelchair user like me can protect myself from disaster and for people to be aware that i exist. therefore, i wish to be involved in the preparedness drill and orientation on how to protect ourselves before and during disaster." "Perchè solo chi vive le difficoltà nel quotidiano riesce a pensare realmente ai bisogni in momenti di difficoltà.Le persone senza difficoltà difficilmente prevedono ogni possibilità." "Me gustaría saber para ayudar a otras personas como yo que tengan algún tipo de discapacidad o que sean de la tercera edad en situaciones de riesgo. La preparación es lo más importante, si podemos ser multiplicadores de la información y/o preparación ya ayudamos a nuestra sociedad." HFA2 - List 5 (five) priorities that you wish to see included in a new disaster risk reduction framework. "Community awareness – for people to realize the potential issues people living with disabilities will face in the event of a catastrophe, so they will think about the needs of their neighbours." "1) Enseñar a todas las personas la forma en como poder manejar situaciones de riesgo y poder enfrentarlas; 2) Establecer y enseñar a la población rutas de evacuación que les permitan estar seguros de riesgos ante ante un desastre; 3) Incluir actividades prácticas dentro de las escuelas, con capacitadores que permitan enseñar a los alumnos la forma en como enfrentar situaciones de riesgo." "1) обязательное уведомление лиц с умственной отсталостью доступным языком о бедствиях 2) ассистирование лицам с умственной отсталостью во время бедствий 3) обучение лиц с умственной отсталостью по вопросам безопасности, в том числе в случае бедствий 4) тематическое обучение профессионалов, предоставляющих услуги лицам с умственной отсталостью 5) исследования и методические разработки по обеспечению безопасности лиц с умственной отсталостью, в том числе во время бедствий и при их угрозе"
"1) Perhatian yang konkrit dari semua pihak baik masyarakat maupun lembaga; 2) Pendampingan dan support untuk menumbuhkan semangat penyandang disabilitas; 3) konsistensi pendampingan agar penyandang disabilitas bisa mandiri; 4) bantuan baik secara moral maupun material; 5) mendapat perlakuan dan hak yang sama bersama masyarakat." "Don’t work with colors or small letters, I am colour blind." 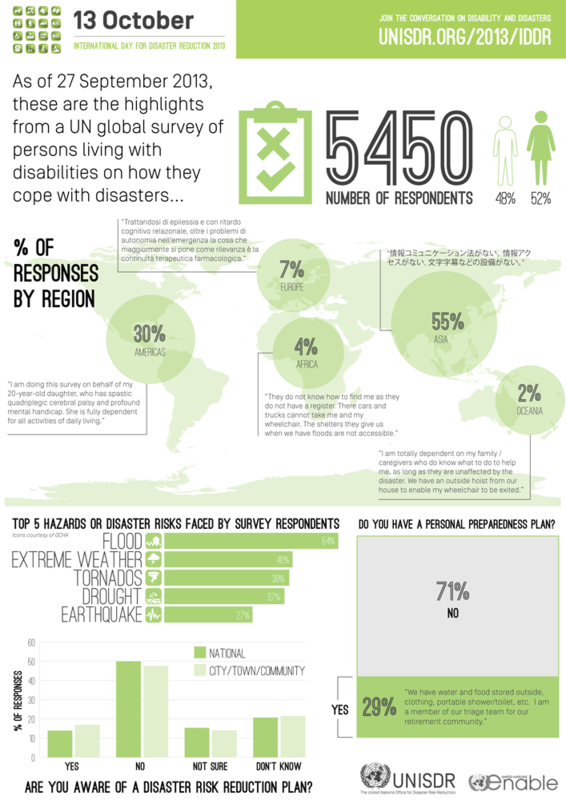 Why should disaster risk reduction be disability-inclusive? Are you on Pinterest? 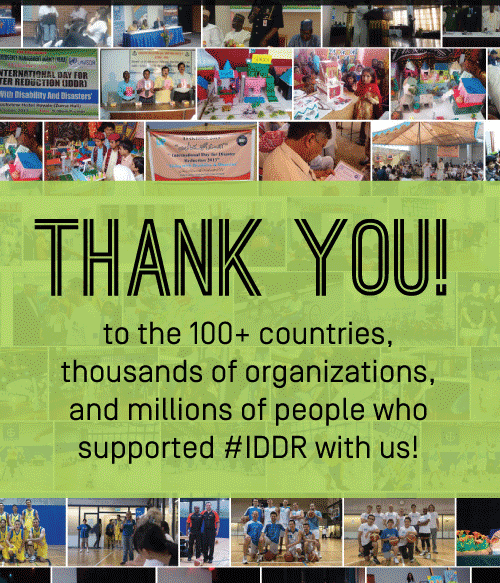 Want to join us in pinning images to the IDDR13 board? Send us an email at unisdrcomms(at)un.org. This webpage was developed following guidance from "Making Accessible Websites for the United Nations".